Terry Pratchett is most well known for his first novel that took place in Discworld, a fantasy realm balanced on the backs of four elephants, which themselves stand atop a huge turtle (as seen in the introduction of the video below if you cant imagine it yourself). 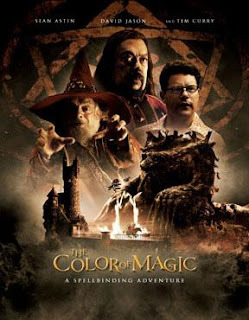 The Color of Magic was first released on television in Britain back in 2008, today marks the first day it will be available to the public in the United States (pending you get ION). "Based on the first two books in best-selling author Sir Terry Pratchett’s (Yes, he was Knighted in 2008 and was astonished to be honored in this way) hugely popular Discworld series, The Color of Magic stars Oscar nominee Sean Astin, Tim Curry and David Jason. Additionally, Brian Cox serves as the narrator and Christopher Lee takes on the vocal role of Death. Discworld, a magical realm, has got its first tourist! Rincewind, an incompetent and cynical wizardry student, has recently been expelled from Unseen University and been given the task of guiding Twoflower through the city state of Ankh Morpork. The two are forced to flee the city after a terrible fire and are sent on a fantastical journey across the Disc, which is unknowingly being controlled by a board game played by the Gods. Along the way Rincewind encounters a few problems: firstly, as an expert coward, he doesn’t feel he’s the best person to guard a naive - and extremely rich, by local standards - tourist through one of the roughest cities in the multiverse. Then, of course, Rincewind experiences a vicious and bloody struggle with his arch-enemy, the power-hungry maniac Trymon. Oh, and the world is coming to an end. Can Rincewind defeat his nemesis and save Discworld from ultimate destruction?" I'm sorry I missed this. There's so little worthwhile science fiction on TV. Thanks for dropping by my blog last week.